Looking for a theme for your bullet journal next month? Give one these Disney inspired bullet journal ideas a try. I’m forever a Disney fan. Although, I have never been to Disneyland or Disneyworld. But, I grew up on Lion King, The Jungle Book, Cinderella, and Snow White. And no matter how old I get, every time I get sick or am feeling a little down, I revert back to my inner child and just want to snuggle in a blanket and watch Disney movies. Walt Disney Studio was originally named Disney Brother Cartoon Studio. The first admission ticket to Disneyland was sold for just $1. Today prices are upwards of $170 per day! Disney World in Florida is roughly the same size as San Francisco. The sorcerer in Fantasia’s name is Yen Sid. That is Disney spelled backward. Snow White was the first movie to ever release a soundtrack. Some of the Disney parks have an underground tunnel system for tasks like trash removal and cast transportation. Main Street USA smells like vanilla because of cool little scent gadgets called smellitizers. Disney’s French family name was D’Isigny. There is a minor planet named after Disney. Its name is 4017 Disneya. Mickey Mouse’s original name was Mortimer Mouse. But Walt Disney’s wife convinced him to change it. At Walt Disney World, you are never more than 30 steps away from a trash recepticle. When Disney World first opened in 1971, it averaged 10,000 visitors per day. Today it averages 50,000 per day. Belle is the only Disney princess with hazel eyes. Merida from Brave is the only Disney princess to have a Scottish accent and only the second to have an accent that isn’t American. Originally, Disneyland was supposed to include a Land of Oz, but it was never constructed. With such a wide array of characters and movies, the possibilities of Disney theme ideas are endless. You can kick it old school with some Snow White or feel all the feels with Inside Out. 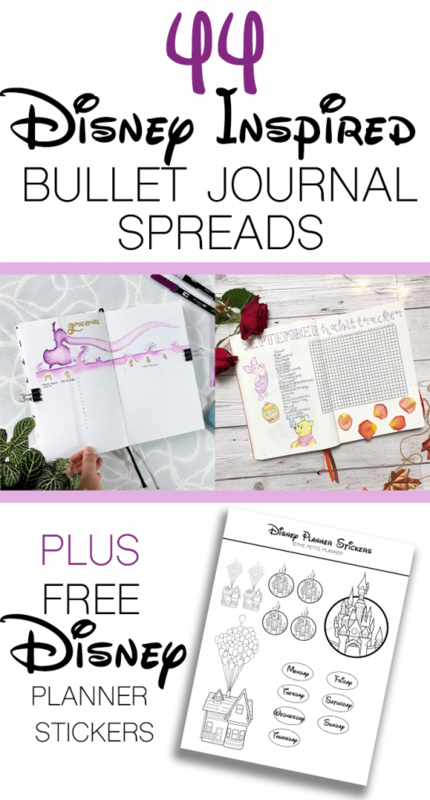 If you wanted to create an entire bullet journal that was Disney themed, you could. Each week could be a different movie. Maybe you start a Disney timeline and work your way from old Disney classics and finish up with a more current, Disney Pixar themed spread. People on Instagram have been incorporating Disney into their bullet journals for quite a while now. And the theme is becoming more and more popular. 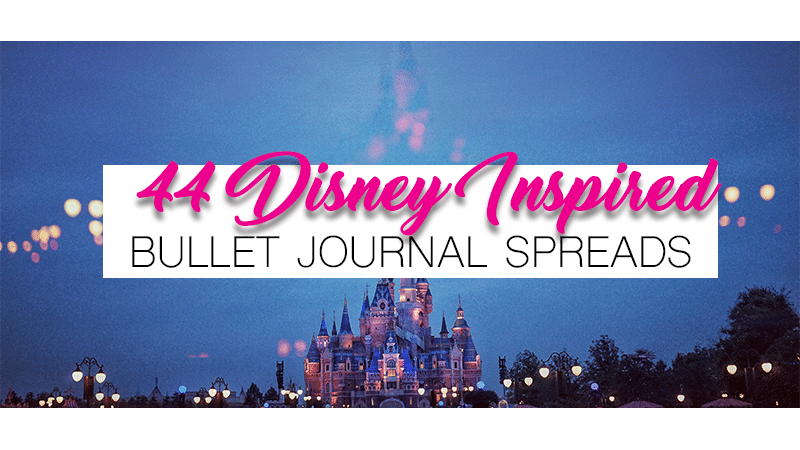 So, I wanted to share some Disney bullet journal ideas with you to kickstart your creativity and inspire you to go out and create your own Disney themed bullet journal layout. Want to snag these free printable Disney planner stickers for your bullet journal? 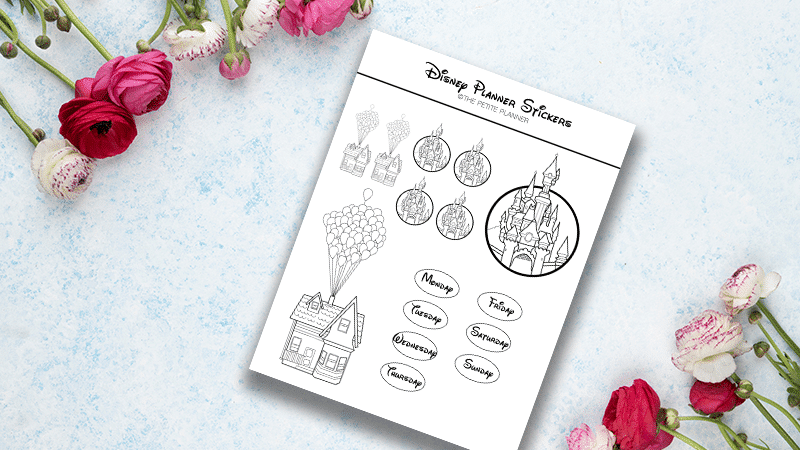 You can use them to decorate your pages or create your own Disney inspired cover page. Fill out the form below to be added to my newsletter and you will instantly get your download of this sticker sheet. You’ll also receive a welcome email with the password to my VIP Resource Library, full of free printables.